Stems: Erect, often several, glabrous. Leaves: Alternate, simple, linear, 4 to 10 inches long, to 1/2 inch wide, rigid, glabrous; margins entire; upper leaves reduced in size. Inflorescences: Raceme-like to spike-like; heads usually few, short stalked or sessile, to 1/2 inch wide, terminal ones often largest; bracts often much longer than heads, overlapping, glabrous; tips tapering to points, curving back and downward or spreading. Flowers: Ray florets absent; disk florets 10-60, corollas purplish, pubescent within. Fruits: Achenes, cylindric, usually 10-ribbed, tipped with feather-like bristles, enclosing small seed. 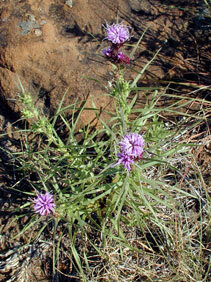 Habitat: Dry, sandy, upland prairies.